There’s real money to make with legal cannabis. One company just posted a $105 million profit! And the stock is surging in early morning trading. Go here to multiply your pot stock profits. Canada rolled out 100% legalization of recreational cannabis on Oct. 17. And Aurora Cannabis (NYSE: ACB) is the first major pot stock to report earnings in the wake of this historic change. Aurora reported revenues of $35.8 million. That was a 33% increase over the last year! Meanwhile, the company increased the number of medical marijuana patients by 250%. Lots of skeptics are concerned that the growing market will result in lower cannabis prices. That hasn’t materialized yet. Aurora increased the price of dried cannabis by 15% during the quarter. Shares of Aurora Cannabis were trading 4% higher in early morning trading. Click here to multiply your profits – with my top seven cannabis stocks. Aurora also shared data from the first two weeks of selling cannabis to Canada’s recreational market. In Ontario, Aurora accounted for 30% of the total sales through the Ontario Cannabis Store. In Ontario, the provincial web site is the only place to buy cannabis. In British Columbia, Aurora has the 4 best-selling dried cannabis products on the market. And in Prince Edward Island, Aurora and it’s MedReleaf subsidiary are the top 2 in terms of sales. Across Canada, Aurora is now offering 450 different cannabis products. The company has a current production capacity of 70,000 kg. By early 2019, that’s expected to double to 150,000 kg. And longer-term, Aurora is targeting 500,000 kg of annual production capacity. In the most recent quarter, Aurora Cannabis sold 2,676 kg of marijuana. At 70,000 kg of annual production, Aurora will be an absolute powerhouse. Assuming an average sale price of C$6 per gram . . . Aurora could generate annual sales of $420 million! Go here to make 3X – 10X more profits with Aurora Cannabis. Earnings season is just getting started for pot stocks. And I’m expecting positive news. Plus, these companies will report details from the first few weeks of recreational sales in Canada. 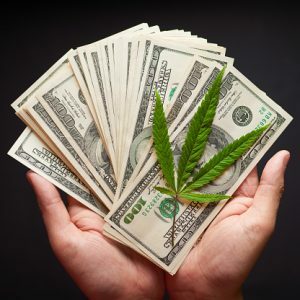 Tomorrow, Cronos Group (NASDAQ: CRON) and Tilray (NASDAQ: TLRY) will report earnings. And Canopy Growth (NYSE: CGC) reveals it’s results on Wednesday. Stay tuned! It could be a very exciting week for marijuana stocks. Are you CONFIRMED for my live pot stock briefing? Just click here (it’s FREE). What’s Your Plan for a Bear Market?